What are the different colors of Clydesdales? How much can a Clydesdale pull? How big is a Clydesdales hoof? How many Clydesdales are born each year? How long is a pregnancy and how much do foals weigh? Where can I learn more about Clydesdales? Clydesdales can grow to over 18 hands tall. A hand is four inches, so this would be 72 inches or 6 feet. A horse is measured from the ground to its withers. If you feel at the end of a horse's mane, you will find a small flat sport, which is the withers. When a horse puts their head down to eat, this is the highest point of the horse. Mature Clydesdales weigh between 1600 and 2400 pounds, as much as a Volkswagen beetle. One of the most popular colors for Clydesdales is bay or brown. Clydesdales also can be black, sorrel, or Roan (White hair scattered throughout the coat. White legs are common, but black legs are often found. White spots can occur on the body. A knowledgeable judge ignores the color in a show ring. This hair, called feather (or spat where it goes over the horses hoof), originally helped protect the horses legs. Now it is primarily for show. It depends on what they're pulling. When pulling a wagon, a Clydesdale can pull many times its own weight. This is why Clydesdales were so popular in the cities pulling large wagons of goods. Clydesdales are known for the size of their feet. One of their horseshoes is about the size of a dinner plate and weighs about 5 pounds. A thoroughbred race horse has a shoe about one quarter of that size. Horseshoes are held in place with special nails. The nails are hammered up through the shoe and exit the hoof wall. This does not hurt the horse as the hoof wall is similar to the structure of a human fingernail. Depending on their age and the amount of work they might be doing, an adult Clydesdale may eat 25-50 pounds of hay and 2-10 pounds of grain or commercially prepared feed each day. The United States has the largest number of Clydesdales, with Canada, Great Brittan and Australia trailing in numbers. There are approximately 600 new horses registered the United States annually. A typical pregnancy lasts for 11 months. A newborn foal can weigh 110-180 lbs. A broodmare (mother to foal) may produce 100 lbs of milk daily and the foal can gain up to 4lbs a day for the first few months. Clydesdales vary in price based on many factors. Bloodlines, quality, size, age, color and markings, and level of training all effect prices. Some Clydesdales may sell for as little as $1000, but most sell between $2500 and $5000. The top level of horses can sell for prices equivalent to luxury automobiles. Yes! 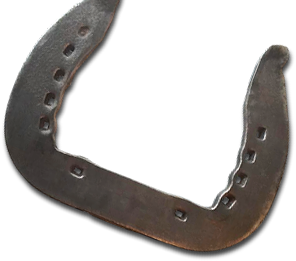 Most equipment manufactures now offer saddles, bits and bridles in draft horse sizes. The Clydesdales are very easy to train and their great style is a hit in the show ring. They also make exceptional trail horses due to their calm disposition. Most current owners would welcome the opportunity to visit and answer your questions. During the summer and fall, many Clydesdales can be found competing at state and county fairs. This is a wonderful opportunity to observe and learn. 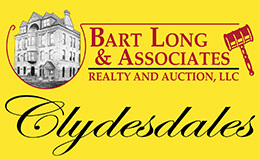 Each April, The Clydesdale Breeders of the United States holds its Annual Meeting and National Clydesdale Sale in April, offering annually approximately 150 Clydesdale horse for public auction. 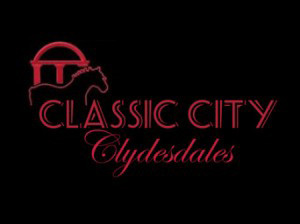 The Clydesdale Breeders also host a Fall Classic Draft Horse Sale in October of each year!